(Ellesmere Island) down to 1 km2 (Mount Kenya). They calculated the temperature sensitivity of mass balance for 12 glaciers, correlated the resulting sensitivities with the logarithm (base 10) of precipitation, and then estimated the mass-balance sensitivity of each of their 100 glacierized regions from its estimated precipitation. The area-weighted average of mass balance sensitivity for the 100 regions is -0.39myr-1K-1. This represents the mass-balance sensitivity of global glacier cover to a globally uniform temperature change. It is a useful parameter for comparing different models. The work by Oerlemans & Fortuin (1992) and Oerlemans (1993c) is very important as it informed the 1996 and 2001 assessments of sea-level change by the IPCC (Warrick et al., 1996; Church et al., 2001) and forms the basis for further work. Zuo & Oerlemans (1997) calculate the contribution of glacier melt to sea-level rise since 1865 by applying historic temperature series to the mass-balance sensitivities for the 100 regions, plus four more regions representing sectors of the Greenland Ice Sheet. Gregory & Oerlemans (1998) and van de Wal & Wild (2001) simulate future sea-level rise by applying temperature projections from GCMs to the same 100 glacier regions. Despite the increasing sophistication of these experiments they are still based on results from only 12 glaciers upscaled to 100 regions and their validity rests on the correctness of the upscaling. The precipitation for each of the 100 regions is based on 'climatological maps and data from climatological stations' (Oerlemans & Fortuin, 1992) or from a 'Climatic Atlas (of Europe, North America, Asia, etc)' (Zuo & Oerlemans, 1997). On the basis of 'a comparison between the precipitation rates obtained from maps and from the mass-balance studies on the 12 selected glaciers', Oerlemans & Fortuin (1992) increase precipitation in all 100 regions by 25%. This takes account of the fact that '. . . glaciers and ice caps tend to form in the wettest parts of terrain with a pronounced topography' but Oerlemans (2001, p. 115) says 'The correction applied, +25%, is just a guess, however'. It is difficult to assess the correctness of these procedures and I prefer a new approach, see below, that combines results from Oer-lemans & Fortuin (1992) and Braithwaite et al. (2003). The mass-balance sensitivities for the 12 glaciers common to Oerlemans & Fortuin (1992) and Braithwaite et al. (2003) are quite similar across a wide range from the Devon Island ice cap (Arctic Canada) to Alfotbreen (Norway). Braithwaite et al. (2003) clearly distinguish between regional precipitation, in a gridded climatology or on a climatic map, and glacier precipitation on the glacier itself. The latter is generally larger than the former, in agreement with Oerlemans & Fortuin (1992), although their 25% augmentation of precipitation seems a little too small. Despite this, the mass-balance sensitivity from Braithwaite et al. (2003) agrees very well with Oerlemans (1993a) when plotted against glacier precipitation (Fig. 83.3). There is therefore no deep contradiction between results of energy-balance and degree-day models. Figure 83.3 Mass-balance sensitivity for 61 glaciers versus glacier precipitation compared with a curve for the 12 glaciers modelled by Oerlemans (1993a). Results for the 61 glaciers are calculated by a degree-day model (Braithwaite et al., 2003). Oerlemans (1993c) by correlating the mass-balance sensitivity with precipitation from a global gridded climatology with 0.5° resolution (New et al., 1999). They use the resulting regression to estimate mass-balance sensitivity for every 1° latitude by 1° longitude grid square containing glaciers according to the gridded glaciology of Cogley (1998). Their global average of mass-balance sensitivity is -0.41myr-1K-1 (Braithwaite & Raper, 2002), which is in close agreement with -0.39 myr-1 K-1 (Oerlemans & Fortuin, 1992). There appears to be a consensus that the global average of mass-balance sensitivity is rather smaller than sensitivities found in mainland North America and western Europe (Fig. 83.2). This reflects the bias of global glacier cover towards Arctic glaciers with low mass-balance sensitivity. There is some uncertainty about the area of glaciers, excluding ice sheets, in the world, e.g. 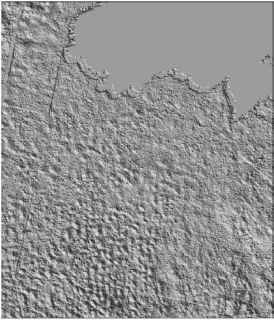 somewhere between 0.52 and 0.68 x 106km2 (Braithwaite & Raper, 2002). With this range of areas, a mass balance sensitivity of -0.4myr-1K-1 is equivalent to a sea-level sensitivity of 0.6 to 0.8 mmyr-1 K-1. To answer Thorarinsson's (1940) third question (see Introduction), a sea-level sensitivity of this magnitude should be detectable over a few decades even if it is less than the temperature sensitivity of thermal expansion.